After thinking for a moment , he spoke to the monkeys along with monkey lords including Hanuman . Thus ends the seventeenth chapter of the book of war of Valmiki Ramayana which is the first book. 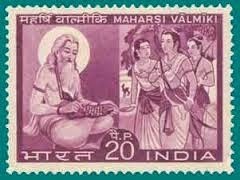 “The brothers Rama and Lakshmana who are the sons of Dasaratha who are excellent men endowed with beauty have come in search of Sita and they are keeping on the shores of this great ocean. Those monkeys forcibly caught that Rakshasa on the sky and brought him down forcibly to the earth. His hands were applied with sandal and agaru paste earlier were shining like the early morning Sun. Series of divine storms blew in their very gross forms sweeping away clouds and breaking huge trees. Those monkeys filled the ocean with all types of trees like Sala and Asvakarna, Dhava and bamboo, Kutaja, Arjuna, palmyra,Tilaka, Tinisa, Bilva, Saptaparna, Karnika, in blossom as also mango and Asoka. "Become not recognizable to others, enter the army of monkeys and count the real numbers of their army, their strength , as to which monkeys are important among them, which ministers of Rama and Sugreeva have come together, which monkeys are leading in front, which monkeys are valorous , how that bridge was constructed across the ocean full of water, how the encamping is done for those great monkeys; the determination, strength and the striking senses of Rama and of the heroic Lakshmana." Seeing that shore less and innumerable great army of monkeys , the king Ravana again asked Sarana. "These excellent monkeys, numbering a thousand crores and eight lakhs, who have been lodged in sandalwood groves, yelling like a lion’s roar and after having stiffened their limbs, are knitting their eye-brows raised in anger. These valiant monkeys, who are terrific and fierce having a ferocious zeal are going to follow Nala. Nala himself with his aforesaid army aspires to smash Lanka forthwith." 27. The monkey army is further described. "The other monkey whom you see as an unshakable mountain and standing in the centre of monkeys is the Lord of all chiefs of monkeys and he is with a boundless energy and who, like a Himalayan hill, very much radiating the other monkeys by his splendour, glory, wisdom, strength and his noble descent, who occupies along with the chiefs of Army Generals, a secret place called Kishkindha, with its forests and trees and which place inaccessible because of its impassable mountains, in which is established a good fortune of devas and human beings, whose charming and golden coloured garland with hundred lotuses is beautifying and that person is Sugreeva. This garland along with a lady called Tara as well as the permanent kingdom of monkeys were presented to him by Rama after having killed Vali ." 31.Rama by magic tries to convince Sita that Rama is dead. Then that younger brother of Khubera saw that pitiable Sita , who did not deserve that fate , sitting looking down at the earth , drowned in great sorrow due to the thoughts about her husband. After having discussed with his ministers about the things that need to be done and after understanding the prowess of Rama , he arranged for getting actions done as per the need. 33.A Rakshasi friend of Sita called Sarama consoles Sita. "O, Sita! Rama, who is endowed with long and well rounded arms and an illustrious man, who has a large chest , who is a man of great energy, an archer well known in the world, a man endowed with muscularity, a righteous minded man, a person of celebrity on earth, a man of eternal strength and a protector for himself and for others has not been killed when he is with his brother Lakshmana, a man of high descent, a knower of doctrines of conduct and behavior, the killer of a stream of enemy forces, a man of inconceivable strength and valor, a venerable man and an annihilator of adversaries." "See hurriedly, the sheen of polished weapons, shields and coats of mail sending forth luster of many hues like the splendor of fire consuming the forest in summer. The flurry of chariots, horses and elephants following the lead of Ravana as well as of energetic Rakshasas thrilled with joy. Is also seen"
After telling this , she went near the Rakshasas and heard what Ravana was talking to his ministers. When she returned back she saw Sita who looked like goddess Lakshmi bereft of lotus waiting for her. When the trembling Sita asked Sarama like this she told her completely what Ravana told his ministers. 36.Ravana chides Malyavan and makes arrangement for the war. Since he has already come under the grips of great anger , with eyes rolling in fury replied Malyavan .